Ask any crafter to tell you about the most frustrating issues with selling items online and chances are you’ll hear “high fees” somewhere at the very top in their list of grievances. Indeed, the impact causedby fees applied just for listing items on most of the specialized handicraft e-commerce platforms can be frustratingly high. And then there’s the transaction fee for each successful sale. But, just as with the outrageously overinflated prices of eyeglass frames, mattresses or cinema popcorn, people seem to gone accustomed to this situation..
Well, it’s business as usual until a new competitor shows up and disrupts the market. Take the eyeglass frame business for example. An online eyewear company called Warby Parker emerged in 2010 and has successfully disrupted the market ever since by selling stylishly cool eyewear online for prices several times lower than the ones people had already gotten used to. Similarly, the mattress business is now being successfully disrupted by a company like Casper Sleep, which ships high-quality mattresses at shockingly low prices. Unfortunately, no one has been able to disrupt the iron grip of the cinema popcorn cartel as of yet. But anyway, the point is that we at TANZŌ have been inspired to do our part in disrupting the online handicraft business by offering, among other things, lower fees. Etsy is a huge marketplace, which makes it extremely hard to get customers to notice your item listing. You need to spend a lot of time and pour considerable marketing expenses into your personal store in order to compete. The good news is that the listing fee is just $0,20. The bad news? The transaction fee is 3.5% of the item price. This is Etsy’s biggest competitor. You have to apply to sell on the platform, which charges a referral fee of 15%. If you are deemed eligible, you can get the $39.99 monthly fee waived. However, getting your truly handmade items noticed on the platform still requires a lot of extra effort on your part, as you have to compete with sellers who list faux-handmade items at cheap prices. Zibbet is a global marketplace for crafters, independent artists and vintage collectors. As a crafter/seller you can subscribe to various plans, which range from $4 a month to $16 a month. If you sign up for a plan, there are no transaction fees. But what if you’re not comfortable with being a long-term subscriber? Such subscription plan is not ideal for crafters who are casual sellers. Operating in the United Kingdom, Folksy features more than 15,000 U.K.-based designers. With a basic Folksy account, it’s pay as you go, and you will be charged £0.15 plus VAT per item listed and 6% plus VAT sales commission. If you sign up for £45 per year, there is only a 6% + VAT sales commission. Aftcra is a site for American-only handmade goods. There are no fees to list your goods, but they do take a 7% transaction fee on every sale, and you cannot sell anything for less than $10. Shopify is for e-commerce stores in general and costs $29 to $299 per month. Signing up only makes sense for seriously business-minded crafters. 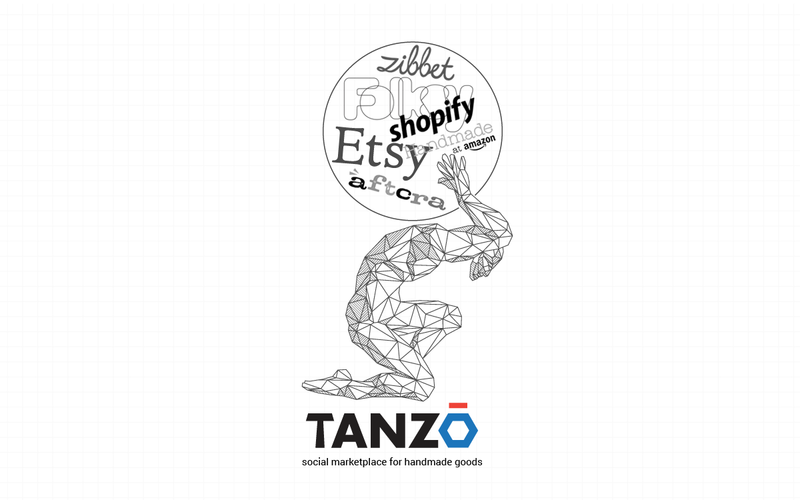 Not limited to any one region, TANZŌ is the new global e-commerce platform that will provide everyone with the same access to affordable buying and selling of handmade goods. True market disruption means giving the people what they have long given up on. In TANZŌ’s case, a decentralized, blockchain-based platform is able to deliver to its users what the above-mentioned, centralized platforms cannot or will not. Because the need for middlemen (PayPal, credit card companies, banks, etc.) is eliminated, sellers on the TANZO platform will be able to enjoy a tiny $0,05 listing fee per item listed and a mere 1,5% transaction fee per item sold (when the price of the item is no more than $1,999). For items priced at $2,000 or more, there will be a flat fee depending on the amount. At the end of the day, what is being a crafter all about, really? Being a crafter is all about freedom. Freedom from having to wake up every morning and commute to some stuffy office. Freedom from having a boss. Freedom from selling your time and efforts to a faceless corporation that only cares about its bottom line. Freedom from doing tasks you don’t enjoy. Freedom from a capitalist system that favours product over art. And, yes, freedom from getting charged high fees from centralized platforms. The revolution starts now and the revolution starts with TANZŌ.